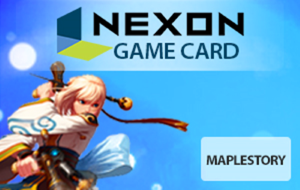 What is Nexon Game Card? Nexon Game Card redeems for Nexon Cash. Nexon Cash is virtual currency used in all games serviced by Nexon America, Inc. Nexon Cash can be spent to purchase in-game items, accessories, and services. Where can you use Nexon Cash? Experience exciting online gameplay with this Nexon game card. It is redeemable for 50,000 in Nexon Cash Points for use in the hottest online games, including the much-talked-about MapleStory. You can also purchase sweet extras for your online characters. Dance, race and score like there's no tomorrow it all begins with this game card. Games at the Nexon Web site are free to download. The Nexon Cash Points provided by this gift card are used in the games themselves. For example, in-game services such as the Cash Shop in MapleStory and the Fashion Mall in Audition require you to pay with Nexon Cash. You'll also be able to purchase pets, clothing, hairstyles, special items and more.